Though marketing is a huge field with many sub-disciplines, when most people talk about marketing they’re thinking of the part of the marketing mix known as promotion, or marketing communications. Despite it being only a small piece of the larger marketing pie, the popularity of communications isn’t all that surprising: it’s the thing we’re exposed to the most. All the ads you see, blog posts you read, and industry events you attend, all of it is marketing communications. So you may feel that you know how to use them to promote your own software. But did you know there are two types of communications, and that you can categorise them based on the result you want to achieve? Choosing the right type of comms is critical for getting the results you want without wasting your time and money in the process. I like to label these categories think this and do that. Think this, otherwise known a brand building, is concerned with getting your customers to know something about your brand or to feel a certain way about it. Brands, and activities that build them, aren’t just fluffy marketing junk. This stuff works to bring you more customers, and large tech brands spend millions of dollars every year on brand building. Take open source projects as an example. Getting your project accepted by the Linux Foundation, or having your company join one of their working groups, creates associations in people’s minds such as collaborative and understands the value of open source. That last one is pretty important for reaching a developer audience. That’s why so many large companies do it. Yes, they benefit from influencing the technical direction of the projects, but it also makes them look good. If you’re the kind of person that likes purchase funnels, brand building activities live at the top. We’re talking brand awareness (does the customer know you exist), consideration (is a customer even thinking about purchasing from you), and brand image (how does the customer perceive your brand). Brand building works best when all customers in a category are targeted, even those who are not in the market right now. The objective is always reaching as many people as your budget allows. Out Of Home (OOH) is a popular medium for brand building ads. 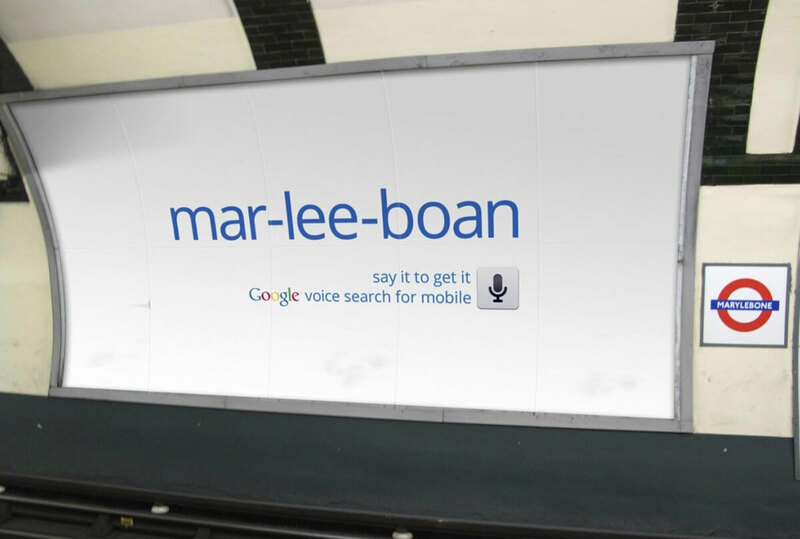 Here’s one from Google from 2011 to drive awareness of voice search. Of course, many companies don’t have the budget to pay for OOH and it’s certainly not the only medium that builds brands. Speaking at industry events might be the best choice for smaller brands. Brands are built over the long term because it takes time for customer perceptions to shift. Emotion plays a really big role in building brands. We’re better at remembering things if they emotionally connect with us. But brands are a weak force, and despite what many marketing detractors say, you can’t influence people in any significant way with advertising. It’s only a nudge. That’s why there’s a second type of comms. Lots of marketing is about getting someone to take an action or elicit a response. Some marketers would say too much (we’ll get to that in a minute). Whether it’s purchasing your software, downloading your whitepaper, or signing up for a trial, these are all of examples of activation. This is, by far, the most popular type of promotion you’re likely to encounter – both as a consumer and as a develeoper promoting your own software. That’s because it’s a required part of selling your products. Google and Bing Ads are a classic example of activation. Users are searching for things to purchase, and your ads try to persuade them to purchase your things instead of your competitor’s. For application downloads, social channels can be very effective. 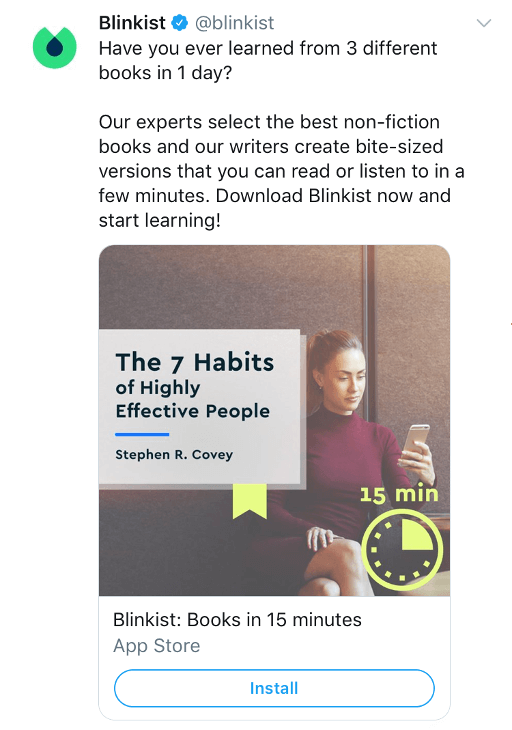 Here’s a Twitter ad from Blinkist focusing on activtion by getting users to install the app. In terms of the purchase funnel, activation lives at the bottom. Customers in this section are looking to make a purchase. They’re both problem and solution-aware, and actively considering your offering. In contrast to emotional brand building, the aim with activation is to precisely target your customers with tailored, rational messages and get them to act now. Because you’re targeting customers looking to buy very soon, activation is a (relatively) strong, short-term tool. It works very well for increasing sales, but only over short periods which leads to sales spikes but not up-and-to-the-right sales growth. To achieve profitable growth you need both brand building and activation. 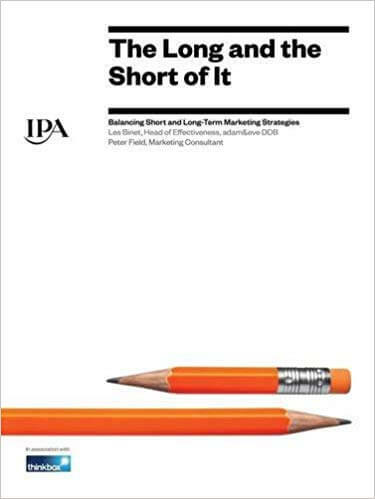 Though the two ideas of brand building and activation are nothing new, they’ve really been popularised in the marketing community by Peter Field and Les Binet through their work with The Institute of Practitioners of Advertising (IPA). Most successful campagins combine both long term and short-term activities. 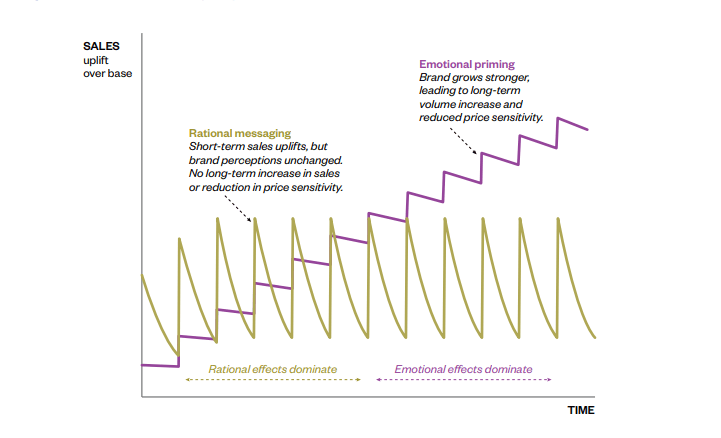 Emotional campaigns generate more powerful fame/buzz effects (long term) and rational ones generate better short-term sales. The optimum budget allocation between brand and activation is 60:40, on average (though its varies by category). Activation in some form is required for selling your product. So exactly what role does brand building play? Brand building increases long-term sales volume, and it reduces price sensitivity in your customers, allowing you to charge more money for your products and services. The two types of communcation work on different timescales. Activation may be able to drive short-term sales volume but brands are the heart of profitable long-term growth. This balance of long and short is one that all developers understand. Building a Minimum Viable Product and getting your software product in the hands of customers as quickly as possible is critcal to make sure you’re building the right thing. The results are immediate and short term. But great software products requires thoughtful design and a robust architecture. That incurs an up-front cost that’s only realised over years as changes are easily made without the fragility that comes with unmaintainable spaghetti code. As an industry, developers have learned the value of balancing short and long-term. Promoting your software requires exactly the same thing.